A thin rectangular plate under a uniaxial tension has a uniform stress distribution. Introducing a circular hole in the plate disturbs the uniform stress distribution near the hole, resulting in a significantly higher than average stress. Such a thin plate, subject to in-plane loading, can be analyzed as a 2-D plane-stress elasticity problem. In theory, if the plate is infinite, then the stress near the hole is three times higher than the average stress. For a rectangular plate of finite width, the stress concentration factor is a function of the ratio of hole diameter to the plate width. This example approximates the stress concentration factor using a plate of a finite width. Create a structural model for static plane-stress analysis. The plate must be sufficiently long, so that the applied loads and boundary conditions are far from the circular hole. This condition ensures that a state of uniform tension prevails in the far field and, therefore, approximates an infinitely long plate. In this example the length of the plate is four times greater than its width. Specify the following geometric parameters of the problem. Define the geometry description matrix (GDM) for the rectangle and circle. Define the combined GDM, name-space matrix, and set formula to construct decomposed geometry using decsg. Create the geometry and include it into the structural model. 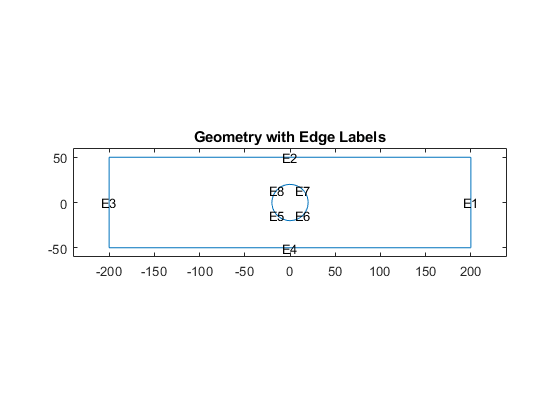 Plot the geometry displaying edge labels. 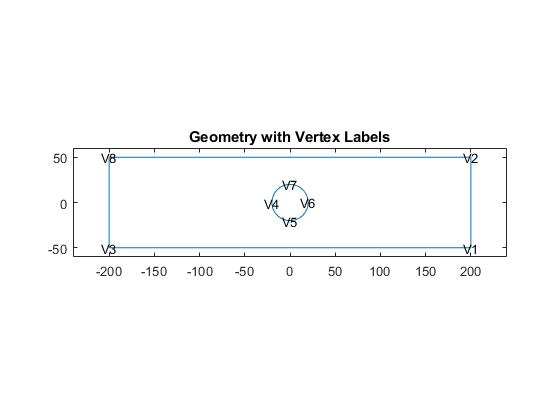 Plot the geometry displaying vertex labels. Specify the Young's modulus and Poisson's ratio to model linear elastic material behavior. Remember to specify physical properties in consistent units. Restrain all rigid-body motions of the plate by specifying sufficient constraints. For static analysis, the constraints must also resist the motion induced by applied load. Set the x-component of displacement on the left edge (edge 3) to zero to resist the applied load. Set the y-component of displacement at the bottom left corner (vertex 3) to zero to restraint the rigid body motion. Apply the surface traction with a non-zero x-component on the right edge of the plate. To capture the gradation in solution accurately, use a fine mesh. Generate the mesh, using Hmax to control the mesh size. Solve the plane-stress elasticity model. Plot the x-component of the normal stress distribution. The stress is equal to applied tension far away from the circular boundary. 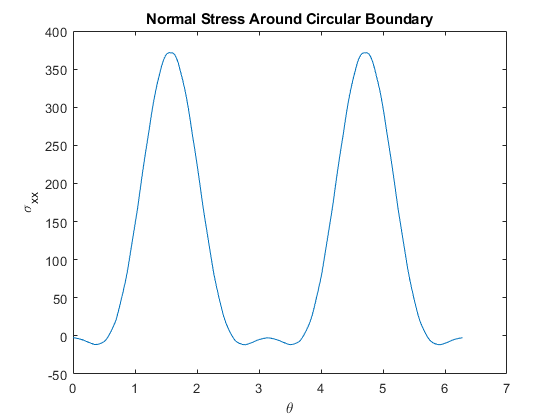 The maximum value of stress occurs near the circular boundary. 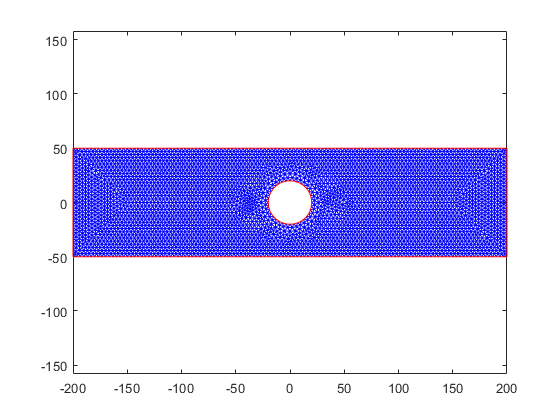 To see the details of the stress variation near the circular boundary, first define a set of points on the boundary. Then interpolate stress values at these points by using interpolateStress. This function returns a structure array with its fields containing interpolated stress values. Plot the normal direction stress versus angular position of the interpolation points. The plate with a hole model has two axes of symmetry. Therefore, you can model a quarter of the geometry. The following model solves a quadrant of the full model with appropriate boundary conditions. 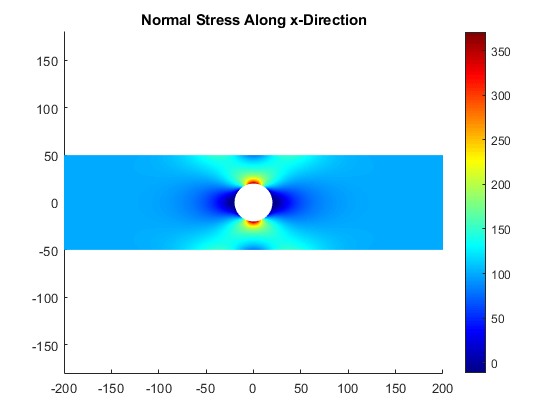 Create a structural model for the static plane-stress analysis. Create the geometry that represents one quadrant of the original model. You do not need to create additional edges to constrain the model properly. 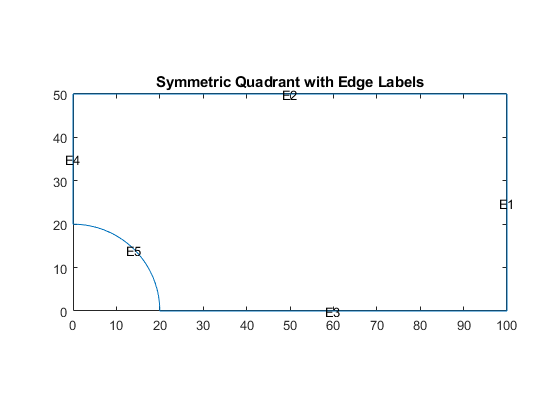 Plot the geometry displaying the edge labels. Specify structural properties of the material. Apply symmetric constraints on the edges 3 and 4. Apply surface traction on the edge 1. 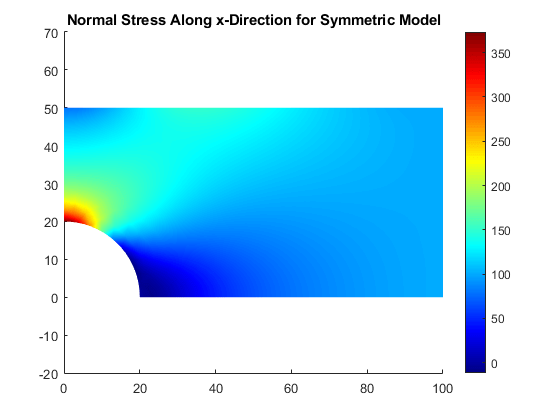 Generate mesh and solve the symmetric plane-stress model. Plot the x-component of the normal stress distribution. The results are identical to the first quadrant of the full model.